The Bel Fuse, Inc. Viewsonics Ground Loop Isolator (VSIS-EU): The Viewsonics VSIS-EU Ground Isolator is used to eliminate the hum and horizontal bars caused by ground loops. When two or more devices are connected to a common ground through different paths, ground path noise or a ground loop can occur. This is actually quite common in home cable systems, even those that are well designed. The result of a ground loop is audio hum and/or horizontal bars in the TV picture. If the re-work of the cable system's ground connections and establishing solid ground points in your cable system does not resolve these problems, then a Viewsonics Ground Isolator is the most reliable way to fix it. The Viewsonics VSIS-EU creates an electrical open on BOTH the center conductor and the outside shield, designed to work from 0-100Hz (DC current and AC current frequencies). The isolator allows cable signals above 100Hz to pass regardless of whether a ground differential exists between the two connecting points. 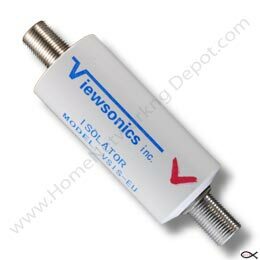 The metallic housing of the Viewsonics VSIS-EU coaxial ground isolator provides adequate EMI shielding. It also is environmentally sealed to prevent ingress of moisture and humidity that has been shown to introduce CPD to a subscriber's premise drop. Robust design includes a metallic housing that provides excellent RFI shielding of >135 dB. Housing is environmentally sealed against moisture and humidity. Device comes standard with “F” type female connectors. All ports comply to all existing SCTE (Society of Telcommunications Engineers, www.scte.org) standards. Product shows superior RF performance operating at a frequency range of 5 MHz-860MHz. Maximum RF insertion loss is 1.5 dB. at 860MHz.